Portobello mushrooms have a wonderfully meaty texture that lend themselves beautifuily to a main course … one that will leave you feeling satisfied without being too full, the way a burger patty might. My friend Jason Gavann went a little crazy at a Pennsylvania farm stand – with wonderful results. Nearly everything we needed for these Mushroom Caps came from there. 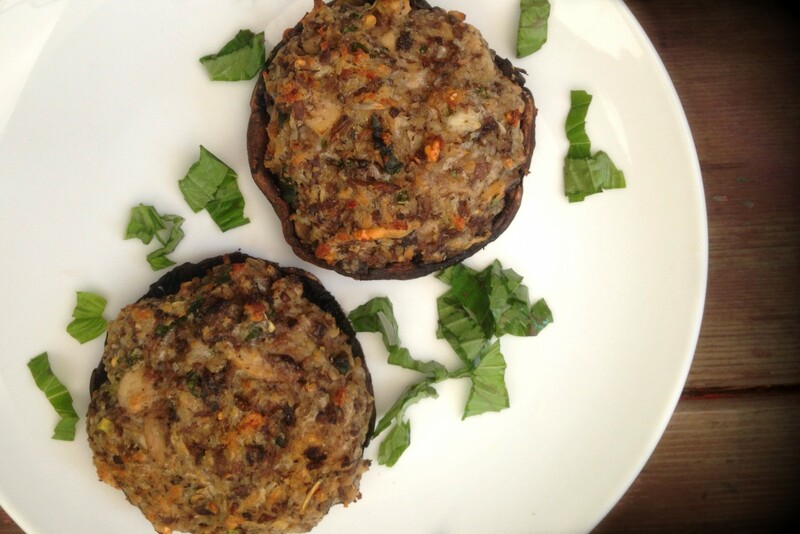 These aren’t so much ‘stuffed’ as they are ‘topped’ with this delicious mushroom and herb medley. Don’t feel like you need to have every ingredient we have listed here – and certainly feel free to throw in a few of your own if the mood strikes you! Below is Jason’s recipe.. and it was absolutely scrumptious. Cut the stems off of four of the Portobello mushrooms. Brush both sides with olive oil. Set aside. Chop up the stems and the remaining portobello mushroom. Place in a medium sized bowl. In the bowl, add 1/2 cup breadcrumbs, parmesan cheese, minced garlic, chopped basil, egg, butter, salt, pepper, and crushed red pepper flakes. Stir, adding in two tablespoons of olive oil. Stir the stuffing mixture well until all elements are moist. Spoon the stuffing mixture onto the four mushroom caps, distributing it evenly. Place the mushrooms into the oven. In either case, about 5-7 minutes is enough to cook them through, so that the mushroom is softened, but still firm. To brown the topping, place the mushrooms under the broiler, checking frequently to avoid burning, for roughly two minutes. Leave it in just long enough to get a nice browning. The cheese will crisp up and give the topping a bit more texture, and a rich, delicious flavor. Drizzle olive oil lightly over mushrooms, and sprinkle with a light dusting of sea salt. 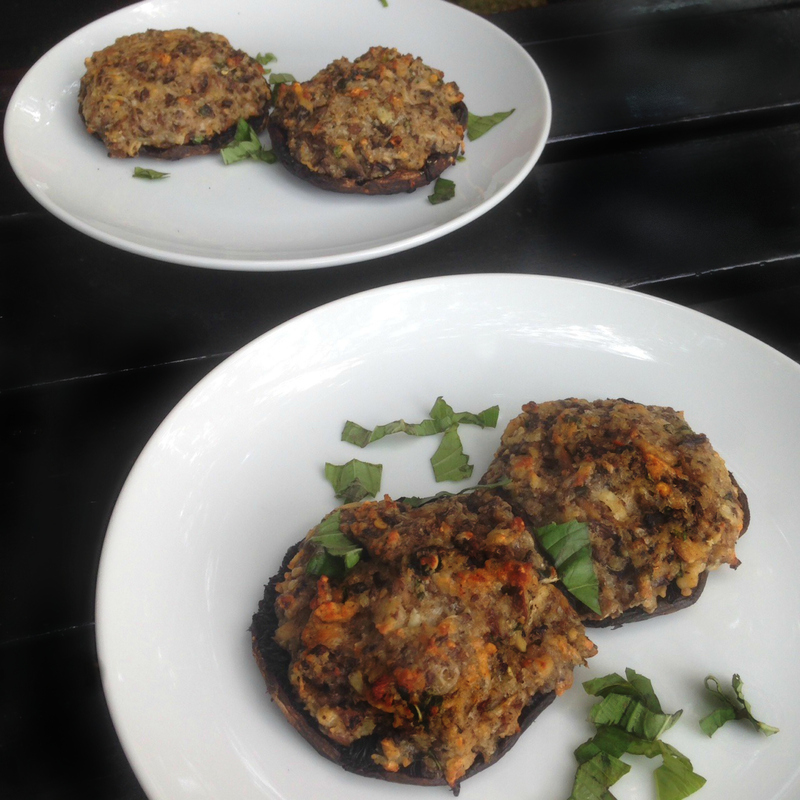 Stuffed mushrooms is a great dish to make when you have a lot of ‘little’ things left in fridge or pantry. Have half an onion? Chop some and put it in! Love chives? Go for it! Don’t be fenced in by what’s in the recipe itself… just keep it simple!